Sierra's View: Five Reasons Why Halloween is a Teachers Least Favorite Holiday. Five Reasons Why Halloween is a Teachers Least Favorite Holiday. Don't get me wrong, there are many things I love about Halloween. I love the vintage, black decorations. I love all the kids in their adorable costumes. I love Hocus Pocus (that counts, right?). I love candy. Cause, well, I am human. But, I think it's safe to say that Halloween as a 6th grade teacher might be one of my least favorite days of the year. I know, am I a Halloween Scrooge or what? I don't know, maybe it's the fact that the kids are all cracked out on candy seven days before AND seven days after the specific holiday. Mostly, I just think it's hilarious. I usually just bring my camera and take pictures of students and put it on the end of year slideshow so I can remember the candy-induced, attention-driven costumes. Now, I know some of you teachers out there may disagree with these statements. I would just like to inform you that I sort of have a love/hate relationship with Halloween. I don't necessarily HATE it, I just have to mentally prepare for it, every year. In fact, some of my own coworkers and friends who are teachers may disagree with all of this. As a general rule though, throughout a couple of years of teaching and talking with fellow teachers, I have noticed a pattern. 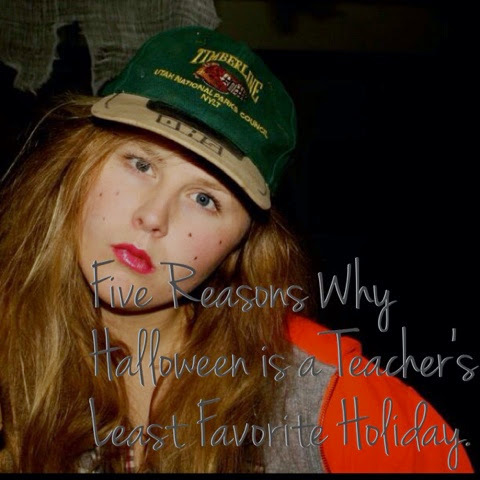 So, I give you Five Reasons Why Halloween is a Teachers Least Favorite Holiday. Reason #1-Please, kid, don't die. We spend the entire day basically just trying to make sure the kids don't die. Pretty much the average comments that happen on this day. I spend the whole day making sure that the students don't kill themselves or each other. So lovely. Reason #2- My Ears Cannot Take Any More Loudness. Classes are loud. Include Halloween candy, costumes and excitement and now you have 25 students who are on an equivalent of crack cocaine. That's all I have to say about that, really. Yikes. Reason #3- I Have Worn Too Many Costumes in my life. I have to come up with a costume EVERY.SINGLE.YEAR?! And hello people, I am dressing up for school everyday, for other holidays, for plays, etc. homegirl is running out of ideas! I like to think of myself as a creative person, but okay, this is just ridiculous. I'm broke. Teachers get paid crap. I don't have the money nor time to buy or make a costume. And let's be honest, sometimes thinking of a costume is just way too much brain power. Ain't nobody got time for that. The Day After Halloween. OMG. Can we all just take a minute to THANK THE BIG GUY UPSTAIRS THAT HALLOWEEN IS ON A FRIDAY THIS YEAR?! Sometimes even worse than Halloween is the day AFTER Halloween. They expect students to come to school and focus and not stash candy in their desks? Oh okay. I usually get a combination of two things on the hangover of Halloween. 2. Then a sugar crash. Reason #5- But, like, can I take a nap? Okay, so I know I'm an introvert. But for being an introvert, I have a lot of energy. I do great with my students and actually do fairly well after school, considering. But that day of Halloween just WIPES ME OUT. Holy Hannah. Like, I don't even want to celebrate Halloween after school. Id rather lay in my bed and sleep in the dark with silence so I am not bombarded with noise and costumes and scary things. Sigh. May you be safe and happy and not kill your children. I promise I won't. Wow! The kids at our schools are NOT allowed to wear costumes anymore. At all!! And in after school, we didn't let them eat ANY of their candy they got from school (same rule on Valentine's). But November 1 was always SO terrible. But this year should be better, yeah? Because November 1 is Saturday! I'm not a huge fan of Halloween either - Christmas is where its at. I'm very lucky. I teach at a charter school and we have a uniform. Students (and teachers) aren't allowed to dress up because they have to stay in uniform (and teachers have to stay professional). I, however, wear my black slacks and an orange shirt and earrings that say "trick or treat". That's "Dressing up" for me. The kids also aren't allowed to have any type of food in any of the school's classrooms, so the only opportunity they have to eat candy is lunch. My daughter attends a charter school. They're allowed to dress up for Halloween but we have a Fall Festival prior so they get to play games and jump around while eating lots of candy and confections. The staff always encourages healthy snacks as well, so it's nice to see so many parents bring good snacks and just a little of the goodies! I don't think I could handle being a teacher. I like my kids, but that doesn't mean I'm a kid person. Parents really need to learn how to guide their children and teach them to make better choices. Haha, I'm not a teacher but I totally feel for you as I work with children too! I do still really like the holiday, though I don't have to deal with too much! Hope your day was bearable! I am not a teacher and the stuff you cited is exactly why ;-) I really appreciate all of you who have the patience, passion and dedication to work with our kids. I can only imagine, I'm with one kid as a parent and go through a lot of these. A room full of them and I'd go insane. I don't have kids and cannot imagine how crazy this holiday is! I also live in a place that doesn't get any Halloween traffic and I stay inside so that I don't contribute to the potential of being on the road and adding to the danger! Teachers are paid like crap. Agreed. And all the effort is just too much. I can imagine that making it mandatory would take all the fun out of it. I thought about my son's teachers this year. I know they were over those costumes by the end of the day! I never thought of how crazy it could get for teachers on Halloween. Oh man! I definitely remember all the sugar crashes! I'm sure it's all the candy or maybe even the anticipation of candy haha. I always loved dressing up for Halloween as a kid, but seeing it from a teacher's perspective... I could see why it wouldn't be as fun! I wondered if one of your reasons would be kids all on a sugar high - I imagine that would be a lot to handle! Good thing Halloween is only once a year and it looks like you survived this one! The schools here in Ireland are cracking down on the sweets and chocolate due to a lot of kids having severe nut allergies. I can imagine the noise of all those kids though! I give you so much credit for being a 6th grade teacher. The cliques, the bullying... that was such a hard year for me. I'm glad you can see the humor in it though -- this post was hilarious! Obat Telinga Bernanah Menahun – Dapatkan obatnya disini Anda BISA BAYAR SETELAH OBAT SAMPAI dengan pemesanan yang mudah hanya melalui SMS dan OBAT LANGSUNG KAMI KIRIM. Meskipun ada banyak faktor pemicu penyebab miom, namun sebagian besar penderita miom mengalami penyakit yang satu ini karena diakibat penyebab yang sama. Salah satunya adala hormon estrogen yang bisa menyebabkan miom. Rekomendasi banget. Jangan lupa baca ya. Informasi yang diberikan sangat bermanfaat.